Wonder Woman #27 Review – AiPT! In the second part of “Heart of the Amazon” in Wonder Woman #27, writer Shea Fontana and artist Mirka Andolfo have Princess Diana on the search for a wedding reception bomber. The mystery brings her face-to-face with a scientist jealous of her powers. “HEART OF THE AMAZON” part two! Someone close to Diana is behind the most recent attack on her and her friends…but what has this person learned about her powers that she never even knew herself? 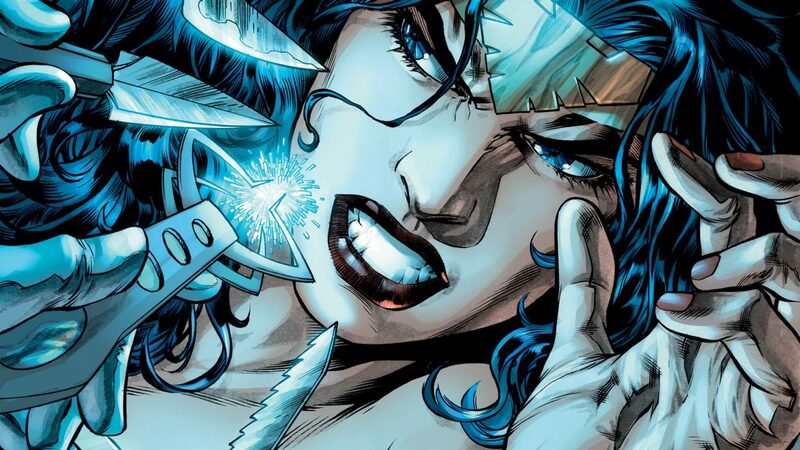 In the first part of “Heart of the Amazon”, Fontana showed a desire to take Wonder Woman in a slightly less serious tone compared to Greg Rucka’s run and show how well Diana has adapted to man’s world. Diana is now working with a firm called Mega Ultatech, and she goes off on humanitarian missions around the world. One night, she decides to take a break by going to the wedding of Etta Candy’s brother. But a bomb went off, and Wonder Woman is left stunned by the idea that someone would plant a bomb at a party. Part two opens with an actual bang, as Diana wasn’t able to stop the bomb from exploding. However, she does her best to save everyone, although Etta is wounded. Wonder Woman thinks she’s taking Etta to a safe place, but it turns out that there is an unexpected threat at Mega Ultatech. Wonder Woman isn’t dealing with gods and monsters in this story. Instead, her enemy turns out to be a regular woman just jealous of the superhero she works for. There’s a little bit of a Themyscira memory in this issue, but Fontana otherwise sticks with the present. Unlike the previous issue, which seemed a little desperate to connect her past on Themyscira to what’s going on in the present, there’s only one short flashback scene here. Unfortunately, the villain in the book turns out to be a character we’ll never see again who is only driven by a single emotion. Andolfo continues to provide stunning artwork for Wonder Woman, with dynamic action and a splash page that’s screaming to become a poster. Romulo Fajardo Jr.’s colors keep the book looking fresh and makes Andolfo’s work pop from the page. Again, Andolfo’s work is highly stylized here. It could be considered a bit too cartoony for some, but she presents a Diana that feels like she could be a part of our world. The cliffhanger ending introduced in the last two panels of the last page are a little shoehorned in, since the main story that started with #26 is wrapped up nicely. But you’ve got to keep readers coming back somehow and teasing a villain in badass armor is one way to do it. Fontana and Anfolfo's "Heart of the Amazon" Part 2 delivers a one-note villain for Wonder Woman, but features plenty of satisfying action. Andolfo's art continues to be bold and is better here with more action to draw. There's less reliance on Themyscira flashbacks to give Diana the sudden burst of inspiration she needs to succeed. The villain is revealed to be a character we'll likely never see again, and she's only driven by jealousy of Wonder Woman's power.